This morning on my bus ride to work I was kicking back admiring the view of Auckland city and as I always do, was listening to a podcast. Being the start of yet another month in a year that is flying by I had that familiar feeling of panic that I haven’t completed even a quarter of the tasks I had hoped to by this time*. So it was a happy coincidence that I tuned into this TED radio hour podcast, which addressed the things we can learn from slowing down and procrastinating (yes, that’s right, procrastinating!). Lately I’ve been thinking a lot about how much time I spend doing productive/active tasks like field work, analysing data, or writing a manuscript. Most of my days are made up of these tasks in addition to all the other little things that make up an academic’s life, like replying to emails, reviewing manuscripts and sitting on committees (and let’s face it, extended tea breaks). While one day is never the same by the end of the week I feel like I’ve been going from one task to another, always in a bit of a hurry and never really taking the time to step back and think about where my research is going. Most weeks could be considered productive because I am usually moving projects forward (even just a little), but I’m not really allowing myself to think about the bigger picture and make longer term plans for new projects. The largest part of my anxiety at work comes from the fear of not having the biggest and best ideas to develop into large-scale projects. It could be that I’m just not a very creative person, but perhaps (hopefully) this could be greatly improved by setting aside time to develop those little inklings into big ideas. What I’ve slowly started to recognise, and what was driven home in the TED podcast, was that we can’t always be moving forward all the time. Although this problem applies across the board in academia, not allowing time to think and plan can be particularly costly for early career researchers. For those of us without permanent positions there is a lot of pressure to come up with a real zinger of an idea that we can write-up into the next big winning grant application. This hopefully gives us a couple more years of salary, and may even give leverage towards getting the elusive permanent position. We are also under a lot of pressure to publish profusely and I can’t help but think that if I’m not producing my peers will be, and I don’t want to fall behind when it comes to being competitive for jobs. For the really good ideas to come, the ones that aren’t immediately obvious, we need time to reflect and think deeply. Although it’s quite possible that these big ideas may show themselves through fortuitous discovery while working on a current project, or through a stroke of genius, we still need lots of time to fully develop these ideas. It’s pretty much impossible to do this if you are always in a rush to get the next job done. So how does procrastination fit into all of this? In Adam Grant’s TED talk and in a New York Times column he discusses the attributes of original thinkers and why a moderate amount of procrastination can be helpful. He argues that very organised people, the ‘pre-crastinators‘, tend to rush in to new tasks and want to finish them quickly to reduce their anxiety for an impending deadline. These people tend to be highly productive but not necessarily creative, because they often grasp the first and most obvious idea that comes to mind and run with it. Pre-crastinators are less likely to sit back and think about alternatives or new ways to approach a problem. I think I could be classified to be a pre-crastinator. I like to reply to emails immediately to get them out of my mind, I always pay bills as soon as they come in rather than waiting for the due date, and I finished my Honours dissertation 3 weeks before the due date while my friends were pulling all-nighters. Little did I realise that I shouldn’t feel quite so smug about being organised because this may be coming at the cost of creativity. On the other hand, it may not pay to be a chronic procrastinator either, because completing a task in a last minute rush may also lead to you grabbing hold of the most simple and not very well thought out idea. Grant argues that finding a happy medium between rushing in head first and putting things off until you have to pull an all-nighter may be a useful way to become more creative. Start something but then put it back down. Don’t finish it straight away. Instead, if you keep the idea mulling over in the back of your mind you may find that you come up with creative insights about how to make it better. People who are quick to start but slow to finish a project may have the creative edge over the rest of us. I would also argue that as well as letting things bubble away in the background, it is also important to actively put aside time to think. By this I mean turn off the computer, put down the pipette, and move into another mental (and maybe physical) space altogether. I’m sure everyone finds that they have a lot of good ideas when lying in bed just before sleep, probably because this is the first time in the day when we’ve slowed down. I think it is therefore important to find the right setting to allow deep thought and creativity. A student in Rutherford’s lab was very hard-working. Rutherford had noticed it and asked one evening – “Do you work in the mornings too?”. “Yes” proudly answered the student sure he would be commended. “But when do you think”? amazed Rutherford. Instead of feeling the pressure to always be doing something with instant, recognisable outputs, I’m trying to put aside more time to think. In the same podcast, Lakshimi Pratury talks about the art of hand writing letters and how they can give you time to consider a deeper response than may be achieved in a quickly fired-off email. This got me thinking about when I have my best ideas. I feel like I’m able to think clearer when I’m cozied up with a good pot of tea and a notebook, rather than staring at my laptop. Although I usually write papers directly into Word now (I was still doing this by hand until my Honours year! ), I still plan out critical ideas and manuscript structures in my notebook first. I also like to print off a few recent papers and read these away from my computer so that I can absorb them slowly and jot down ideas that may spring to mind as I go along. These ideas are then transferred into a word document later on so that I have current and future project ideas in one place, meaning I can shelve them and stew on them to return to at a later point. I often find that once I’ve made these ideas ‘live’ (i.e. made a rough plan or jotted it down in my notebook) they stay in the back of my mind and sometimes listening to a colleague give or talk or reading a new paper can trigger a new direction for that idea. It can be useful to skim over that list of ideas occasionally too and remind yourself of what’s there – I’m sometimes surprised that with time I will be able to add new thoughts to an idea and have a better understanding of how to move it forward. So, instead of thinking that procrastination is the same as laziness, I’m trying to be ok with being less productive in the hope that it may bring some creativity. I’ve also started knitting and hoping that, once I can do it without having to ferociously concentrate, this hobby might be a nice way to actively relax and have some good thinking time. You can just about see the stress in those tight stitches! *In a classic twist on a post on procrastination, you’ll notice that I started writing this on the first of the month and it is now almost October! I recently made one of those decisions which, although pretty normal for a lot of academics, meant uplifting my life in New Zealand and moving to Singapore. I finished my PhD almost 2 years ago now and have been lucky to get several postdoc positions, one at the University of Auckland (where I did my PhD) and a shorter stint at the Australian National University (playing with fiddler crabs in Darwin). These opportunities allowed me to get publications from my thesis out, make some new collaborations and delve into new research areas. The time had come, however, to head off and do something different and so I jumped at the chance to take up a research fellowship at the National University of Singapore. Although exciting, this has meant that my husband and I had to make the decision whether to do this together or live apart for the next couple of years. We decided (after much discussion & ultimately sacrifice on his part) that he would come along too & so he quit his job, we packed up our house, put all our belongings in storage and off we went to Singapore! So here we are, a few weeks into our new life living in a country the same size as my old city but with a LOT more people. The upside is that living in the tropics means there is a pretty incredible amount of wildlife to see, even in a little city park or on campus on my walk to work in the mornings. I’ve been having fun ticking off the birds on campus using this handy website & this great app of Singapore birds. I even found out today there is an app for the snakes of Singapore which is great as we have already spotted three snakes while out and about. 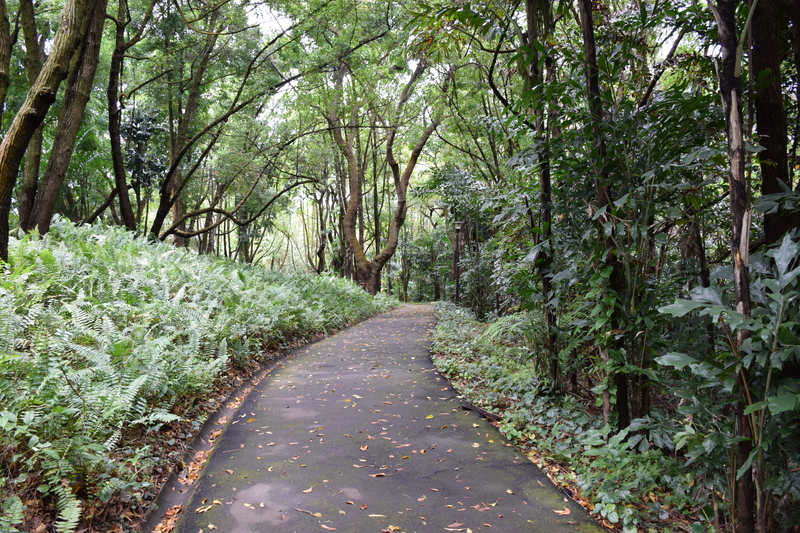 I’ve also realized that birding is a great way to make friends – on the weekend we met a Singaporean bloke called Philip who gave us all the latest gossip on where to see an orange headed thrush (you take the track at Bukit Timah with the stairs, turn left, then go straight and you should see a bunch of other birders with their tripods). 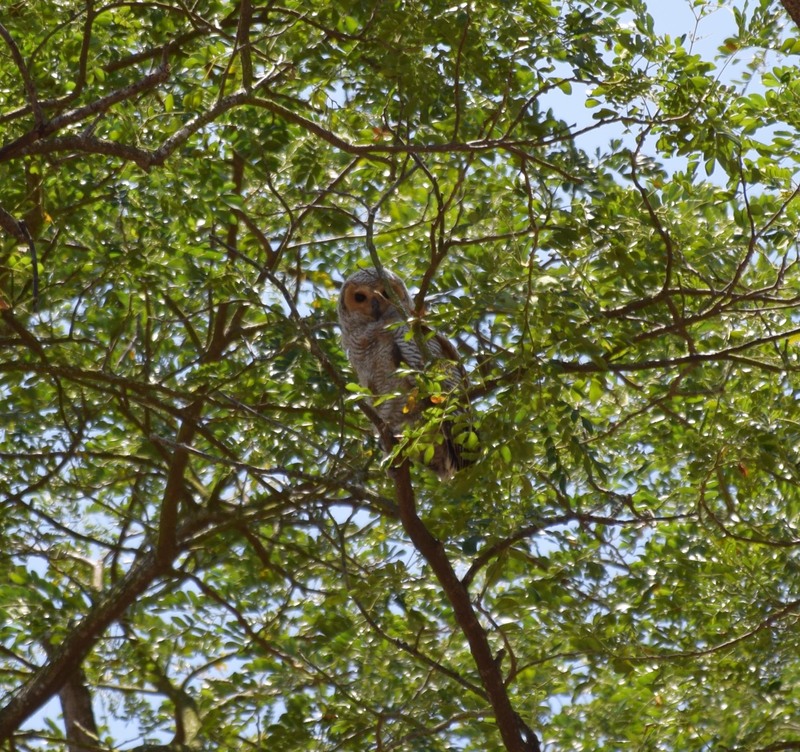 He also told us how to find this super cute baby Spotted Wood Owl at Pasir Ris Park which we spotted snoozing up high in a tree near the beach (turns out we need a better zoom lens). Anyway, before anyone mistakes me for biologist working on charismatic megafauna, I should mention that I’m actually here to work on jumping spiders (Salticidae). As anyone who has a love for jumping spiders will know, they are renowned for their incredible diversity in colour and their charming courtship behaviours. I’m going to be exploring a few different questions, but the main aim is to trace the origin and evolution of UV-colour in male jumping spiders and to compare this to how females use male colour to make judgments on male mate quality. Daiqin Li’s group ­­has already done a fair amount of work in this area already, which is actually really exciting for me as I spent a lot of time during my PhD working out the very basics of giraffe weevil ecology. Here I can jump in and build on all the great stuff already done and hopefully get stuck in to some bigger picture research such as using phylogenies to map the evolution of colour & its use in mate choice. In the meantime, here are a couple of pics we’ve taken when out exploring the local parks on the weekends – still need to get a macro lens so mostly larger animals so far!